With spectacular green sites and contours, the Mountain Course demands more accuracy than distance. "Shot making" skills are necessary to navigate the terrain. Carved out of the pines with no harsh transition areas and no artificial landscaping, this course is all natural and a real challenge and joy to play. It`s a tribute to its brilliant designer, Robert Trent Jones, Jr.The mountainous 18 hole course, par 58 continues to challenge even the most proficient golfer. 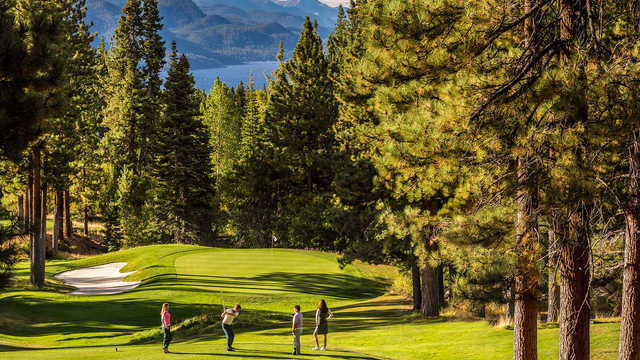 Every hole abounds with creativity and character in design, and many have incredible views of Lake Tahoe and the surrounding Sierra Nevada mountains. Shots should be straight to target sloping landing areas among pines and babbling brooks.